What is CasinoCasino All About? Almost every country seems to have their very own online Casino that brings what they have to offer to other parts of the world. Australia is not left out of this mix with CasinoCasino bringing a full gambit of Australian based Casino games to the online Casino gaming enthusiast. This is a Casino that is licensed by the Malta Gaming Authorities and is owned by L & L Europe Ltd. The site interface is bright and bold and its easy for everyone who is looking for some great Casino excitement to find exactly what they are looking for. Getting started at CasinoCasino is quick and easy no matter whether you are using their flash PC version or their Mobile platform. There is a lot of competition among the various online Casinos and CasinoCasino should have no problem holding their own among them with the great selection of online gaming opportunities that they have to offer. For slot lovers there is a wide selection of slots or as the Aussies would say Pokies, which includes Video Slots and Video Poker. Then for the Table game buffs there is plenty to choose from. For those that like the thrill of Live game play, CasinoCasino has also incorporated Live Play into their lineup. The Pokies vary in their betting range and are comprised of a variety of themes with great graphics and sound tracks. There are a lot of choices for Roulette players as there are 10 versions to choose from. Three of the Live Roulette tables are available for play 24/7 which adds to the fun and excitement. Blackjack and Punto Banco are also available along with several other Table games. CasinoCasino has chosen to focus on one major Casino gaming software developer which is Amatic Industries. While a lot of players may be used to many of the other standard software providers, they are surely going to find what Amatic offers by way of game playing for Casino lovers to be equally entertaining and exciting. The Live Game action provided here on this Australian Casino gaming platform is hosted by the Portomaso Casino. 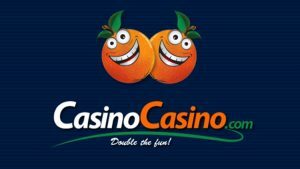 CasinoCasino has kept their Welcome bonus simple but on par with many of the other Casinos online but at the same time they are taking it a little further. They are offering a match up bonus of 100%. on a newcomer’s first two deposits rather than just on the initial deposit. This puts them a step above many of the other online Casinos. The match up is up to 100 Euros for each of the two deposits. There are wagering rules in place for this bonus which dictates the bonus money must be wagered 40x times before withdrawals can be made. This Casino has made sure to make what they have to offer by way of fun and excitement available to anyone who want to play no matter where they are. They have done this by offering a CasinoCasino Mobile version. It is easy to use with a drop down menu offering the selection of games. Deposits and withdrawals can be made just as quickly with the mobile version as with the PC version of CasinoCasino. CasinoCasino has utilized all of the most well known and trusted payment gateways for deposits and withdrawals which are comprised of Visa, Mastercard, Sofort Banking, Neteller, Paysafecard, IDeal, Trustly, Zimpler, EPro and Bank Transfer. While CasinoCasino has provided the basic ways of being able to contact them such as email and Live Chat some are disappointed that customer service is not available 24/7. They also have a simplified contact form that makes emailing them easier.